This year has been a lot of fun. Since November of last year, I have been to Moab twice, ridden “The Whole Enchilada” or most of it. My friend Javi and I went to the Chihuahuan Desert Bike Fest in Feb. That was so much fun, we are going back this year and will make a week of it in the Big Bend National Park and Big Bend State Park. My wife and I visited Pagosa Springs, Colorado a couple of times and decided to live there. We bought land to build on and plan to buy a nearby house to live in, and rent out short-term when the new crib is completed. All the above will take a year or so at best. But time will pass and if we take the right steps, we can make it happen. I’m sure of it. As we make our plans for the future, daily activities keep us focused locally. I decided to monetize the bike trailer by providing an outdoor advertising service, and perhaps hire a few cyclists who would pull them for our clients at AD&M Advertising. So call me at 512.796.5339 to “Roll’em out”. If you operate a charitable organization, I will even pull your sign for free between paid gigs. We invite you to become a sponsor with benefits at Texas Hill Country Bike Tours (a.k.a. “THCBikeTours” on facebook and twitter, or “THCBikeTours” on Tumblr). The year to come promises many great opportunities to share your stories and journeys with our readers as we ramp up the SM advertising. We will offer more of our favorite routes and destinations for adventure cyclists, trail bikepackers, and special feature opportunities. Sponsors are listed with logo and website link on our sponsor page. Enjoy an unlimited number of 365-day online ads with all the benefits of an Unlimited adbirds annual subscriber-advertiser. Sponsor articles may be submitted once per quarter for publication on this blog. All you need to do is set up an annual (12 month) Unlimited subscription with adbirds to receive your Sponsor benefits on Texas Hill Country Bike Tours. Also welcome, are manufacturers of camping and cycling equipment, apparel, maps and associated items of interest to our demographic, the touring cyclist community, commuters, road and trail riders of every age. Call me with any questions or proposals you may have for this publication. My number is (512) 796-5339. Come ride the Texas Hill Country during wildflower season with other amateurs. Self Supported x 7 Days -Stay tuned! 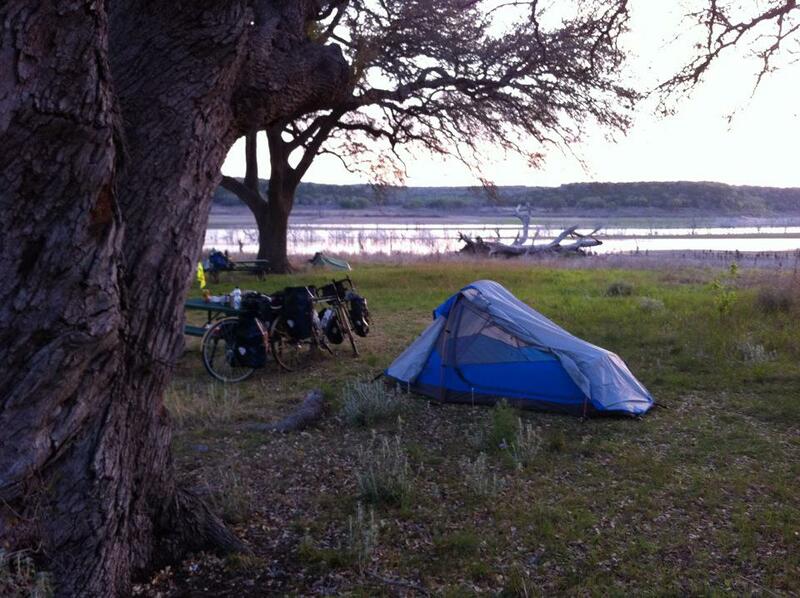 Make reservations for campsites, two tents allowed per site at Inks Lake State Park. You can get a hot shower near the cabins. For the 2016 ride, Enchanted Rock is booked full on May 14th, so we will stay at the Oxford Ranch Campground at CR315 / SH16. They have full hookups, or unlimited primitive camping with showers and water. Enchanted Rock has lots of available sites but the place FILLS UP FAST by people planning their visits during wildflower season. Now is the time to make a reservation for Enchanted Rock! I recommend stopping at HEB in Kingsland for any supplies you need the next 45 miles. This ride leaves Enchanted Rock, and takes the rider over one steep long climb on FM965. After topping that hill, look left for Lower Crabapple Rd. That is the prettiest, and best ride to Fredricksburg. The road takes riders between FM965 and SH16, and into the old city of Fredricksburg. There’s lots to do and see there, and full services, including a bicycle shop. Leaving Fredricksburg on SH16 southbound, watch for and turn left at Bolm Road, then cross the river and stay to the right. Follow the map and this route take riders on a very picturesque adventure to near Comfort, then onto the ACA route to Kerrville-Schreiner Park in Kerrville where you will find full services, including … a great bike shop. Open 8-5. Make your reservation! 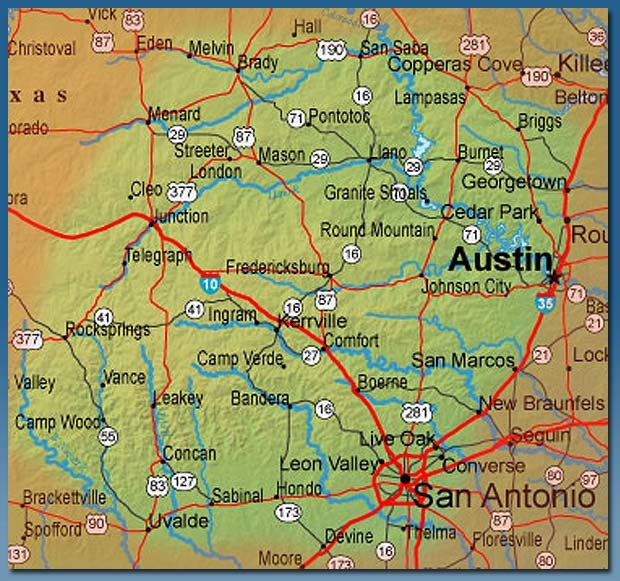 Here they have tent camping sites, RV camping and cabins along the Guadalupe River. Close to town, all services, and a nearby pizza place. Riders, make your reservations! They have quite a few sites still available and AMPLE overflow area camping. Electric sites are near the cold showers. More info to come. This ride takes you along the Guadalupe River and out through Hunt, Texas where you will want to stop at the little store and refresh yourself, getting water and food for the overnight at Lost Maples SP where they sell…. nothing. But the camping is great! This is a beautiful ride of course. No cell coverage in that park though. So before that last long downhill, stop at the rest area and make a call while you take in the view. Flat Rock Ranch is a great place to camp out. It is three miles up from the highway. But what you may need in Comfort! They have an honor box. They have hot showers and camping. 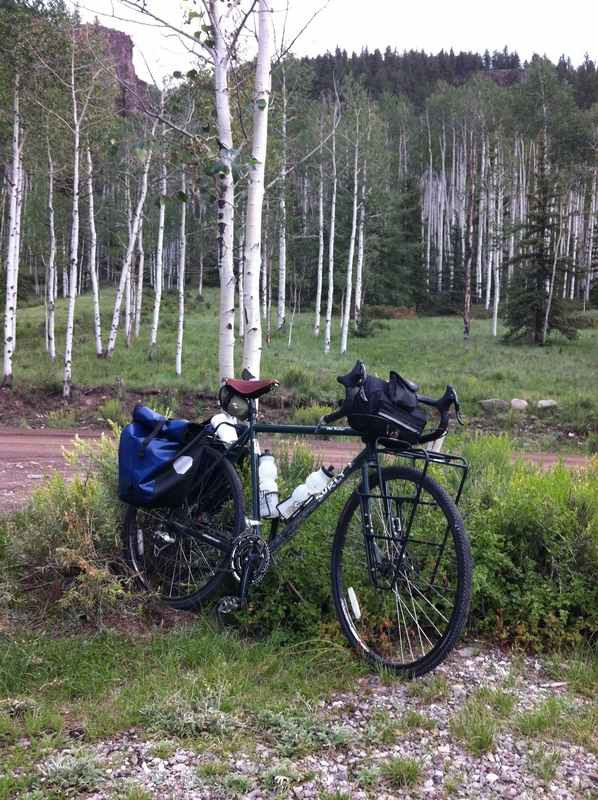 It is a mountain bike destination, private campground. Please contact them about your participation if you are going on this tour. Keep the gate close please. They have some livestock. Thank you! This ride take you past the Old Tunnel SP, and into old Luckenbach, Texas. Get a cold beer and BBQ sandwich there. It’s a great place! Riding East of Johnson City, you will soon be at Pedernales State Park where a shower and cocktail of your bringing with sooth those muscles before the last day’s ride tomorrow morning along Fitzhugh Rd. Day 7: Pedernales Falls SP to starting point Avery Ranch Golf Club 49.1 miles. See Map. There is a shorter route, but I prefer not to ride Hamilton Pool Rd. #Safety! Disclaimer: BicycleTouristClub is not an incorporated entity or a business. We are an ad-hoc group of friends who ride together on bikepacking trips and self-supported bicycle tours. Anyone may join or ride with us. We are not a political or fundraising organization. Participants of these rides nor our “sponsors” agree to hold one another harmless and take full personal responsibility for our well-being. Cruising to work in the dark early morning hours is like sailing at night. The road seems to be my exclusive domain most of the time, and I have often ridden Austin’s major streets for miles without being passed by a motor vehicle. Deer are startled and run in front of my lights sometimes, ad the new Serfas True 500 seems as bright as many motorcycle headlamps. I have a backup headlight, a trustworthy Planet Bike Blaze, loaded with recharged AA batteries. When getting close to downtown I flip that one on flash mode and all the cross traffic – where it exists – get a head’s up because the lights reflect so well off street signs. My backside is lit up even more, with a Planet Bike rear flasher, a Serfas USB charged Thunderbolt tail light, a Tail Fazer, and a unique Austin product, the Flashbak which I will talk about separately, in the best terms. I have always believed you can not have too many lights, – meaning “bright” lights, flashing on your rear when cycling at night. At the very least, one steady and two or three flashing. Riding more and more, this summer found me not only bike commuting, sometimes two to three days a week. I also use a modified Extrawheel bicycle trailer to promote local businesses or my website, known as adbirds. One of my mini-goals is to bike commute five work days in a row; and although there are many demands for my time between office and home, I am planning to take the full-time business plunge in around 2 years. My current “office” is the flight-line at Austin-Bergstrom International Airport, where I work for an airline as an aircraft maintenance crew chief / mechanic. My wife fears the bicycle commuting, especially in darkness as with the evening shift. Since the drunks were very active when I got off work and rode home arriving around midnight; my wife couldn’t get to sleep and be rested for work, so I had to abandon bike commuting for a while. This summer after waiting for the wheel of time and an elder employee to retire, I could again become a “greenie” bike commuter on day shift. So now I’m the resident bike geek / commuter, occasional bicycle tourist, and whatever else time allows between job, business and home responsibilities. At Austin – Bergstrom International Airport my crew starts work at 06:30 and I leave the house at 03:30 for the two-hour commute. Yes, we have a shower at work. Austin also has a first-generation commuter train line with a station three miles from my home in far NW Austin. On the commute home I ride about 5 miles to a station at 5th & Comal on Austin’s East side, and ride a train to the Lakeline commuter station. In Austin, Texas our summer temps are around 100F and there’s a lot of climbing to get home. The train is air conditioned, clean, and only $2.75 for a one way pass. Cycling saves me around $10 per day in fuel, and spares the rest of us around 20 lbs of airborne carbon. I enjoy that aspect as much as the ride. One might ask why I don’t ride the train to work. The train doesn’t run all night, nor to the airport, and may not in my lifetime. My home is about 350 feet higher than the airport, and though that gain is miniscule over a 28 mile route, every inch is felt in our 100 degree heat, so I have no regrets when riding the rails home at 3:30 PM in the Texas summer. Getting to the airport has been fun, and fraught at times. Once, my prime headlamp gave out on Speedway Blvd near the University of Texas, just as I caught a groove in the center of the street while preparing for a curve. Luckily my muscles reacted correctly even though in my mind I was sure pain was about to begin. The good folks at AJs Cyclery got me a warranty replacement for the headlamp so I’m real happy with Serfas and AJs. There are even some street-walkers who proposition fat, middle-aged cyclists whizzing by at 20 MPH at 05:00. Perhaps it’s because the state legislature was in session and lots of lobbyists are in town. Perhaps because it’s getting close to sunup and a new shift of APD is coming on duty. A serious problem isn’t something to joke about but at 05:00 I just laugh quietly, keep on pressing the pedals, and in time the wheels take me all the way.